Chocolate chip cookies were the first thing I ever baked for Jesse. On his first trip here, I decided to bake a batch of my famous chocolate chip cookies (at the time they were definitely not gluten free as I hadn't yet found out I had coeliac disease) and they were so good that he ate almost the entire batch. In fact, he ate so many cookies that he ended up making himself sick - but apparently those cookies were too good to resist. When I found out I had coeliac disease, my old cookie recipe was tossed to the curve because it just wasn't the same with gluten free flour - and I've been tweaking and testing new recipes ever since. 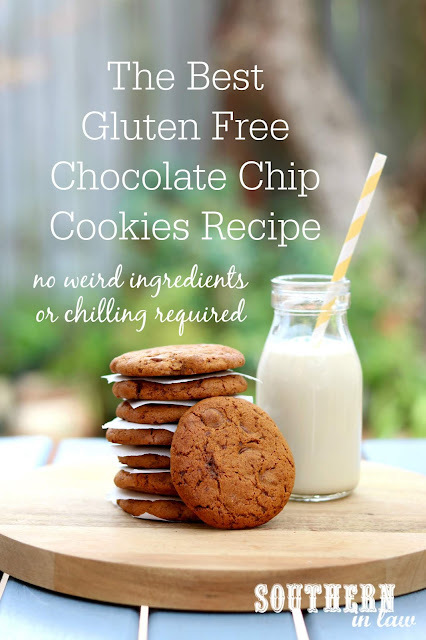 You see, I even thought I'd created the perfect gluten free chocolate chip cookie recipe - but when I took the first bite out of a cookie from this recipe, I realised I was horribly wrong. These cookies are ridiculously delicious. It's the kind of recipe you'll come back to again and again and again because it never fails. 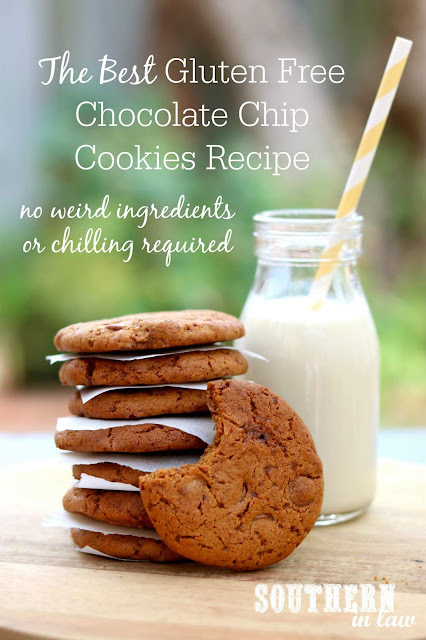 Whether you add chocolate chips, chocolate chunks, nuts or whatever add ins your heart desires, they are seriously ridiculously good.... and so easy too! There's no chilling, no rolling out with a rolling pin or slicing circles off a cookie log - you simply mix, scoop (or roll balls in your hands if you want perfectly uniform cookies), bake and you're good to go! Preheat your oven to 355F/180C. Line 2 baking sheets with baking paper and set aside. In a mixer, cream your butter and sugar until light and fluffy, scraping the sides down a few times in between to ensure everything is incorporated. Once your butter and sugar are creamed together, scrape down the sides and add your egg and vanilla, mixing until everything is combined. Add in your flour and baking soda, mixing just until everything is combined. Stir through your chocolate chips and leave your batter to sit for 10 mins at room temperature (this just helps it to firm up a little. If it's a really hot day or really hot in your kitchen, pop your bowl in the fridge for 10 minutes). Once your dough has rested a little bit, grab a tablespoon or cookie scoop and run it under cold water to wet it. Wet your hands under the water as well and scoop out your mixture (1 tbsp for small cookies, 2 tbsp for large cookies) and either place them directly on the tray for a rustic cookie or quickly roll the dough in your wet hands, flattening out the ball and placing it onto the tray for more uniform cookies like the ones pictured. Place your cookie dough about an inch apart from the cookies around it, leaving room for them to spread. Bake for 7-12 minutes or until your edges are crisp and your cookies are golden. 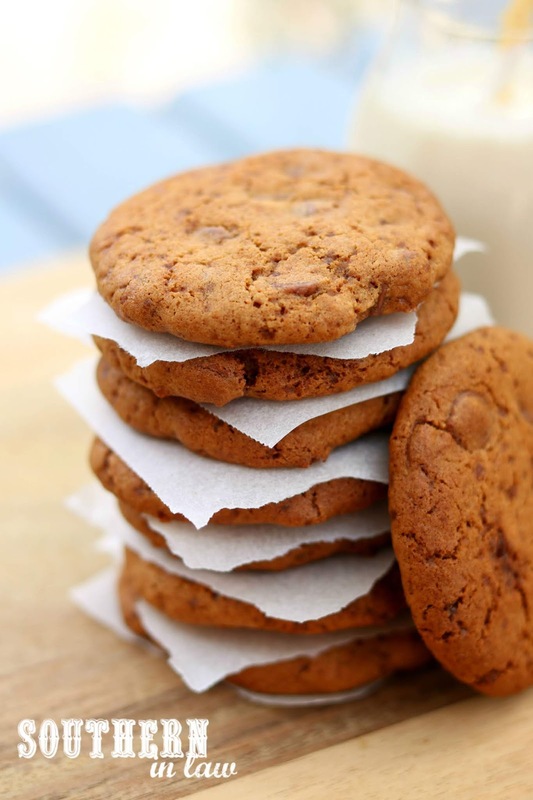 If you like soft cookies, leave them in only just long enough to crisp the edges or if you prefer them crunchy, leave them in a little longer. These cookies are best eaten fresh (and if you ask us, straight from the oven so the chocolate is gooey!) but will keep in an airtight container for 2-3 days. They also freeze really well and if they're frozen fresh, they'll keep nice and crisp and chewy. At room temperature they will soften up over time but if you keep them in the fridge in an airtight container they'll stay crisper. **Let's be real, just throw in as many chocolate chips as you like - I usually use whatever I have in the pantry. Do you have a "famous" recipe? There seems to be three most requested recipes from me; These Healthy Peanut Butter Chocolate Chip Cookies, The Best Paleo Brownie Recipe or chocolate chip cookies. At home, Jesse always asks for The Best Paleo Banana Bread Recipe.